These are tools that are mostly applicable in the area of Employee Development. It is however true that some tools that are good for employee development also have applications on the traditional Human Resources side of things. In many diagnostic tools for leaders and teams there is a scale which indicates how far the leader or the team is on a ladder between two opposite behaviors or style preferences. This could be for example critical evaluation on the one end of the scale and compassionate encouragement on the other side of the scale. (see example below). These kinds of results are often used to coach and develop leaders and teams towards a desired behavior or culture. In many cases the distinction between the “right” behavior and the “wrong” behavior is more linked to the situation at hand, associated risks and/or the person you have in front of you than a simplistic view of correct behavior. For example it may be less desirable behavior to be overly critical in an evaluation of someone who is new to the role and the company or team. In another instance where the risks are high and the people on the team very experienced it may be more appropriate to perform a critical evaluation in the event of a major failure to achieve desired outcomes than to offer compassionate encouragement. This leads to the concept of managing or working with both of the ends of a scale – choosing both sides in terms of developing leaders and teams and helping them to have a bigger capacity to choose the right response for the right situation. The key to helping leaders and teams to embrace more than one behavior or style in selecting the best response to a situation or a task is to create more awareness. Ask the leader you are coaching or the class of leaders to consider any two concepts which are mostly considered as opposites of each other and to then complete the exercise – coming up with possible positive outcomes and negative outcomes from using that particular approach or behavior. In a class situation you can also assign it as an exercise between two or more people to brainstorm together. Once the exercise is complete you can lead a discussion with examples from the class or the leader you are coaching for when it may be appropriate to use one or the other behavior more effectively. You can also choose to ask groups that had completed the exercise to prepare a demonstration (role-playing) to show the appropriate way to respond to a situation based on an example they discussed in the group. Or you may choose to provide some case-studies where the leader or class have to identify which may be the best approaches. These practical exercises will further help your participants understand the choices that they have as leaders when facing different situations and how to at least evaluate the best path forward before they go into action. As a followup action you can ask participants or your coachee to capture examples they come across in the next few weeks/months where they had to make a choice between two opposite approaches and used the exercise above to identify the potential positive and negative outcomes. Using this approach will not necessarily avoid making mistakes and using a less effective approach, but the ability to stop, reflect and choose will make the leader or team more effective more of the time. This approach does not invalidate the tests which offer leaders and teams valuable insights into their own typical approaches and style preferences. This is merely another way to approach the outcomes from those tests to help develop more adaptable leaders and teams, which is highly needed in the current environment where change has become a constant and successfully working across borders, cultures and generations have become essential. Stretch assignments are useful for learning and personal growth and development, because they purposefully contain elements that are challenging in areas where the assignee needs to develop. Designed correctly, a stretch assignment confronts one with the necessity to get out of your comfort zone in order to succeed. to build competency in specific important areas that are or will be important to the future of the company. A stretch is not defined in a general way, but rather it is very specific to a person. While a stretch could mean that one requirement is for the person (plus family, if appropriate) to move to an international location, it inevitably would also include other job-related challenges. Examples include supervising more people, having financial performance targets (for someone who has only had functional roles in the past) or having more complexity such as multiple geographical areas to manage. The key balance to maintain when designing stretch assignments is to ensure that the assignee is put under a certain amount of pressure to learn and grow, but not so much pressure that he or she fails. Mitigating failure risks, there are a few things you can implement to help monitor how things are going with each assignee and to provide a “safety net” for an assignee to get support from. Assign a leadership development coach to help the assignee reflect on experiences, frame up challenges and cognitively choose best solutions and explore new ways of operating to be more successful in the assigned areas of responsibility. Set up intra-company networking events for the assignees to meet, have opportunities to mingle and share experiences and also include a pre-determined learning event tied to overall leadership development objectives within the company. Set up a structure of communication moments with the “home” organization supervisor and colleagues – this is especially important if you plan to return the assignee to the same organization at the end of the assignment. Maintaining ties would greatly improve a successful return and reintegration after an assignment. Communication moments like these can also greatly help colleagues NOT on assignment to learn from the experiences and best-in-class solutions their colleague on assignment is mastering. New and challenging assignments often cause assignees to experience some stress. Supporting assignees to successfully navigate through the new challenges means you should pay attention to a change in behavior or performance which could indicate that he or she is stuck on the learning curve. Signs that things are going wrong are important to notice early-on to maximize chances of turning things around and avoiding an assignment disappointment and/or incurring an assignee retention risk. Pre-departure training should be provided to both assignees and their coaches to understand and recognize signs that things may not be going well and to understand ways to become unstuck in every situation. Expectations for goal achievement by assignees must be specifically captured in a plan and communicated to an assignee along with available rewards for over-achievement of goals. The specific strategic importance of the assignment should also be highlighted as well as the developmental needs to be addressed during the assignment. Ensure that there is a structure that enables assignees to succeed and always follow-through with the check-in points and feedback activities to ensure all is well. Ensure that all those involved in assignments are clear on the role of management, role and responsibilities of supporting coaches, the role and responsibilities of assignees and the role and responsibilities of assignment supervisors and “home office” supervisors. Adequately prepare assignees for their assignments: cultural awareness training (for international assignments), language skills (where needed) and if accompanied by family members – consider a session to discuss the practicalities of moving to a new location with those family members present. Ensure that the assignees get interim feedback on how their assignments are going -at least 3 times per year, but more often if this can be managed. This provides opportunities to refocus and apply new approaches as needed to ensure the assignment is successful. Provide assignees and stakeholders in assignments ample notification about the end date of an assignment. This assures minimum surprises and helps everyone to plan actions leading to a well-organized return upon assignment completion. When assignments are successful in achieving or exceeding on all the objectives, assignees should return from their experiences with increased confidence, leadership skills, and maturity. The personal growth and development they experienced should enhance their ability to make better decisions and build stronger interpersonal relationships with those they lead and follow. Being mindful of how to setup and manage stretch assignments can make all of that a reality. Very few companies are planning ahead when it comes to knowledgeable people leaving the company and retiring. The knowledge that is lost to the company when Subject Matter Experts (SMEs) leave can have direct impacts to the top and bottom-line and yet, there appears to be room for improvement in this process. The question is: how are you ensuring that those with recognized expertise in a specific area contribute to the learning of others? In many cases such a recognized SME is assigned to mentor a more junior employee delivering promising results early in his/her career with the company. However, the time commitment associated with mentoring a one to three people individually plus ensuring that the interactions are meeting content coverage expectations can soon become a concern. So how do you optimize the knowledge transfer or sharing process, while not taking up too much of the SMEs time doing so? The solution is to structure the knowledge transfer or knowledge sharing process and to include multiple participants. Ideally participants with an SME should range between 3 and a maximum of 8 people. Structuring sessions where people interact improves learning as it facilitates discussions leading to deeper understanding and the ability to get into more detail on some topics. You may choose to add elements such as a pre- and post-test to measure the increase in knowledge gained during a session or series of sessions. Preparing managers of session participants to ensure that newly gained knowledge can be applied on-the-job, would further help participants internalize what they are learning and have learned. This greatly improves the amount of newly acquired knowledge integrated in decision-making and execution of daily work activities at the company. Structuring the discussions that will take place between an SME and assigned participants can be a daunting task for an SME, who often does not realize how much he or she knows about various topics. The questions below may be useful. Combine those that make sense to combine and do not get too hung up if the group takes longer to discuss a particular question/topic than anticipated. The questions or topics are merely a guide to help the SME consider the various aspects relating to a topic that he or she may be an expert at. The topics/questions below pertain to a process, but can easily be modified to facilitate knowledge sharing related to tools, applications and other areas of expert knowledge. Capturing knowledge in a database would be one approach to knowledge sharing, but helping adults learn and know how to apply new knowledge requires that you build in room for questions and discussions in the process. This can be accomplished using face-to-face sessions and could also be webinars and video-conferences. The best way to ensure that knowledge is retained and expanding within the company is to apply discipline and structure to knowledge sharing and transfer. This is especially important to do when you consider those who plan to retire in the next two to three years. Involving recognized experts (SMEs) within your company to share their knowledge with others is another important area where this approach could be useful. Using the process and approach shared above will help you plan ahead and improve organizational capability over time . People of all career-stages have talked to me over the years about their careers and how they thought it was going. Very often it would become clear that the person ended up in a role or position which he or she did not really choose, but rather “it just happened.” Apparently many people never took the time to consider, analyze or dream about the options and pathways available to them as career options and then used that to make clear choices about next steps based on that knowledge or dream. The materials I am sharing today can help you, the facilitator, put together a starter workshop designed to give participants the opportunity to reflect on conscious options to consider or analyze in terms of career planning. I am sharing multiple exercises and it would be up to you to decide what to include given the time you have available for the workshop. From an attendee perspective this workshop could help participants from any age (over 14) to get some clarity. Those who are already in steady careers may find it helpful to perhaps fine-tune their own roles in areas where they are not yet fully contributing and adding value according to their own interests and preferences. Career workshop Slides Click on the link to view the slides you will need for the workshop. The exercises that are mentioned can be facilitated using the worksheets in this document. Just click through to find it. This workshop works well in non-profit settings, school or open university settings and can also be used in companies where career planning is initiated as a focus area to help employees develop further skills and set development goals. Every employee has different reasons for showing up at work and there are different ways to motivate each of the people working with you. Since one size does not fit all, it is best to stop guessing and to find out for sure what it is that makes those reporting to you love their jobs. Knowing what motivates your direct reports is also a great way to ensure you retain your direct reports. Of course having a good professional relationship with each of your direct reports goes a long way to ensuring that issues which may demotivate them are brought up early and resolved in open dialogue and discussion. The exercise below can be used by you to first establish what you believe would be motivational before you ask your direct reports to complete the exercise below. Understanding that, as their supervisor, you are most likely not going to get it right without their input may further instill the practice in you to always check your assumptions before you engage when it comes to understanding what would motivate others. The list below contain outcomes that could be motivational to your direct reports in their jobs. This means that these outcomes would keep them interested in continuing to work in this role, for you and in this company. Instructions: Rank the list below in terms of 1 to 14 where 1 means “motivates me the most” to 14 which means “this does not motivate me much.” The ranking is not to say that this is how it is RIGHT NOW, but in the perfect environment, what would be the most vs least motivational to the person doing the ranking. My supervisor is fair in making decisions and communicating them i.e. promotion, recognition, expectations. The next step would be to ask the same employees to rate how much they are currently motivated by the same items from above. Comparing these answers with the answers in A. can help you identify possible ways in which you can improve the motivation of each employee reporting to you. For example, if someone had a high ranking motivator in A. and that same item gets a low score in B. that means you should look for ways to impact that area to motivate and retain that particular employee. Is there anything that I, as your supervisor, can do better to improve your enjoyment of your job/role at the company? I want you to know that I value your contribution and you are an important team member to this project/department. I believe we can achieve great accomplishments in this department/team if we work together and communicate openly about what needs to be done and how to support each other in order to have a better overall outcome for the team/department. I hope you will take the time to let me know of any obstacle that you see which may hinder us in achieving our goals. And I hope you will see any feedback from me in the same light – I want you as an individual to enjoy what you are doing (realizing that not all of our jobs are highly enjoyable – some parts are typically repetitive and maybe mainly administrative) and I want your contribution to the team/department to be clear to you in terms of expectations and how things are going. Is there anything else you would like to bring my attention or which you think we should discuss before we end our meeting? After the meeting you may want to consider reviewing your notes. Some items may be easy to action, simply by you emailing or calling someone in order to set something up. Other items may not be so straight-forward. For example, someone with a performance that does not meet expectations may ask for an increase. Set up a meeting with your HR Business Partner or representative to talk through the items and set priorities. Always make sure you are able to provide direct individual feedback to each employee on the items you discussed in your individual meetings with them. Employees are motivated by different aspects of their roles/jobs at the company and there are many ways in which you are able to influence these aspects. The professional relationship you have with your direct employees also greatly impacts whether someone chooses to stay or leave the company/their role. In the end some employees will leave and you will need to fill those roles by promoting existing employees or hiring new employees. Ultimately, the sign of a good leader is the number of great leaders he or she creates. When they feel the need to leave to move up, applaud them, keep contact with them and congratulate yourself when you see them succeed regardless of where they end up as a result of your great coaching and support. Cross cultural awareness and skills in the workplace are vital to companies striving to enter new geographical areas or aiming to build successful operations at international locations. Ineffective cross-cultural collaboration and communication in international teams have caused many global projects to under-perform and fail to reach desired outcomes. Luckily there are quite a number of tools and team interventions available by now to improve results in these areas. Today I am sharing an exercise with materials, which you can use to conduct a cross-cultural exercise with teams or groups of people. This particular team exercise was developed in such a way that it could be used in many different ways and configurations. For example: you can use a simplified version of this as an ice-breaker during a team-building program or you can use it as a 2 hour-exercise in a full day training program on related topics. To prepare someone to enter or engage with another culture – such as those who will start to work with another culture, whereas the person/team previously worked mainly with homogeneous teams (you could make up a small group of people who are selected to receive cross cultural awareness training). To help multi-cultural teams pay more attention to cultural differences which could make it hard to communicate and collaborate effectively. To help team members understand where and how cross cultural communications could possibly end up with unintended outcomes. Once you have reviewed how the exercise works, I am sure you will be able to come up with additional ways to use it with the teams/groups that you work with. The exercise can be run with groups as small as 12 and you can also do this with groups of 30 people – should you have enough additional facilitators to support the coordination, support and debriefing portions of the exercise. 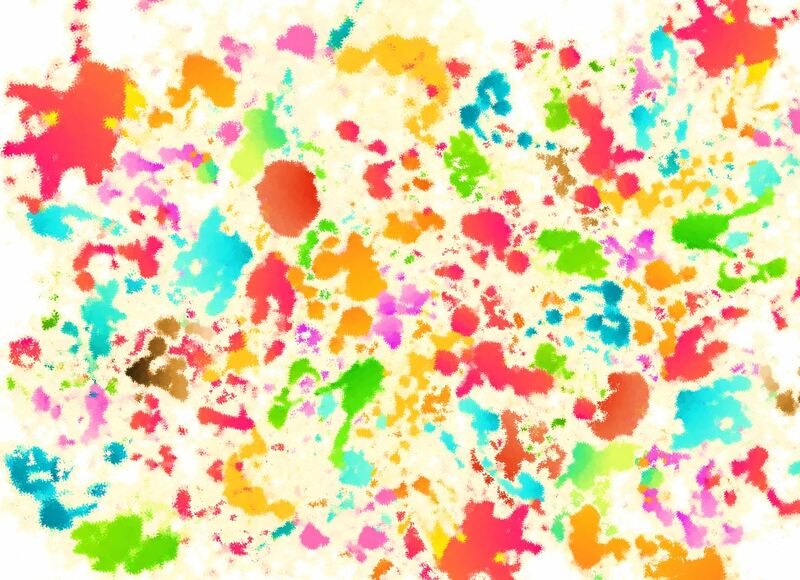 Culture-preparation sheets for different cultures – named after random colors (see below). These sheets are used by “foreigners” to this culture to prepare for interaction. This mimics information that one can typically find online or in books about another culture and which can be studied to prepare oneself before engaging with another culture for the first time. 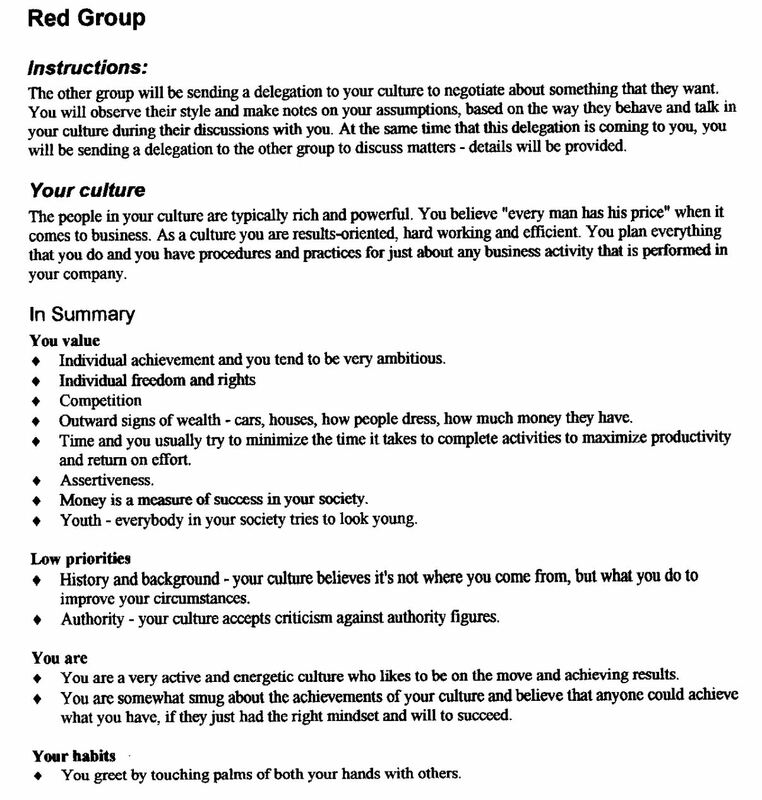 More comprehensive cultural sheets to help group members of a particular culture (as set up in this exercise) to understand their own culture. This means they are better able to act according to their own culture when they encounter another culture in this exercise. This material goes a bit deeper than surface-level behaviors to explain to some degree WHY this culture would do certain things and how their past beliefs and experiences have shaped them into the culture they present today. 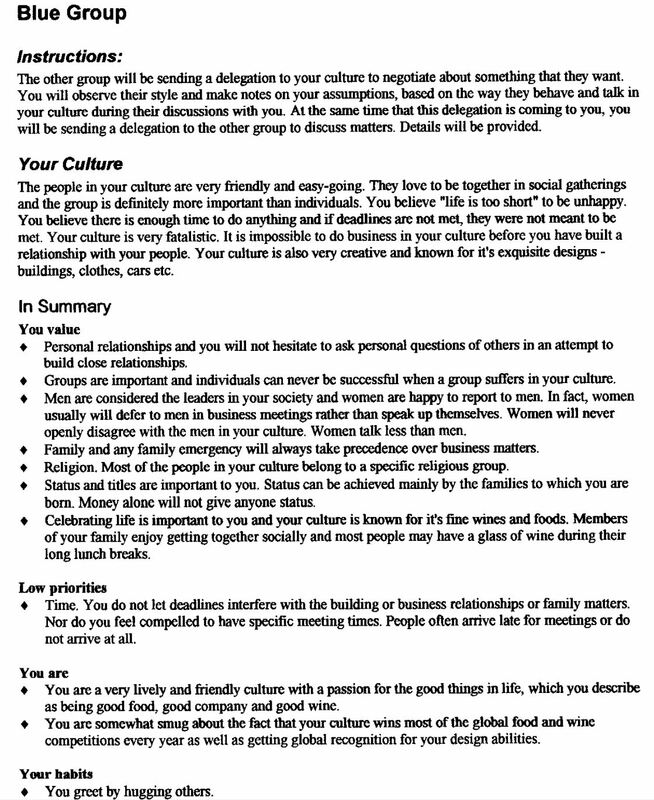 Assignment to indicate to each cultural group what they are hoping to accomplish in the upcoming interaction/negotiation meeting with some members of another culture. With groups of less than 20 people I tend to just pick two cultures and not all 4. You may of course go with more than cultures – just remember to add more time to debriefing and discussion sessions after the exercise. Make sure that each cultural group has at least 6 members so that it is easy to divide into 2 cultural delegations of no less than 3 members. For example: If you have a group of 20. Split them into two cultural groups of 10 members each. Make sure each cultural group can meet uninterrupted in a dedicated space to discuss and prepare for their assignments. Imagine you pick the Red and the Blue cultures. Out of the 10 members of the Red culture, 5 will (after preparation) meet with 5 members (which is half of the members of the Blue culture) to work on their assignment. And the other 5 members of the Red culture will meet with the remaining 5 members of the Blue culture. You will have two intercultural meetings taking place between Red and Blue delegations with two different assignments. 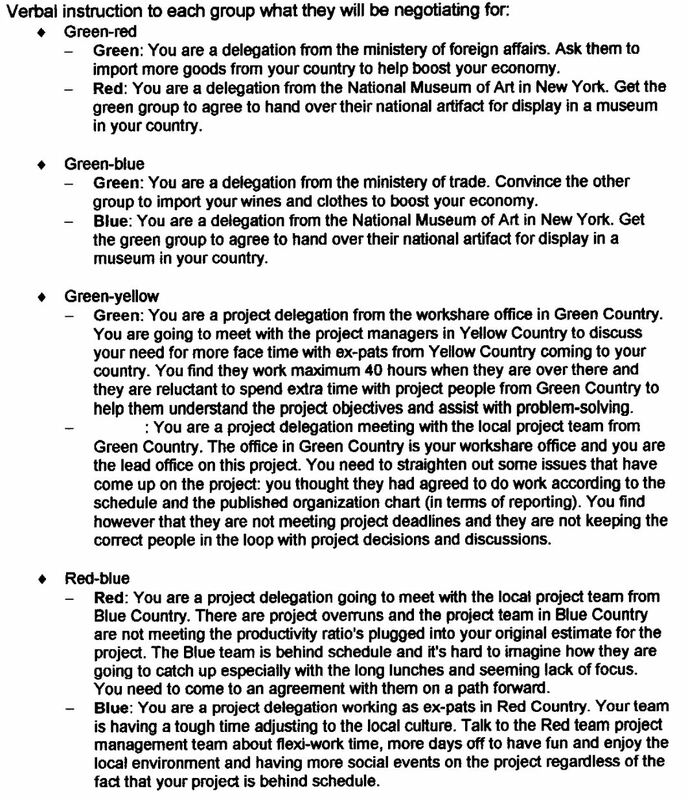 The Color name called out in the assignment information above refer to the traveling delegation. 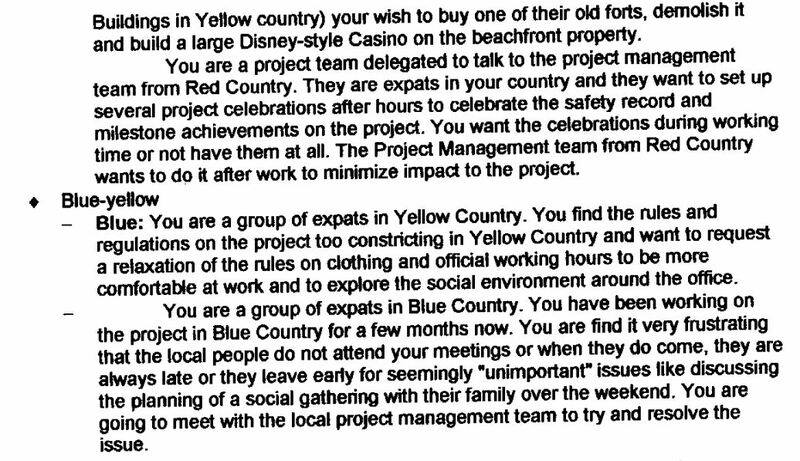 So in the case of Red and Blue – the delegation from the Red Culture traveling to meet at the Blue culture location will work on the assignment called “Red” and the delegation from the Blue culture that will travel to meet with the Red culture will prepare for the “Blue” assignment. Those remaining at the location to host the traveling delegation will prepare for the discussion that the other cultural team will want to have. (see graphic below for further illustration). Use a basic framework of looking at cultures to set up the exercise portion, which comes next. Share with the group: We will divide you into different cultures and we will provide materials to help you understand your own culture as well as other cultures that you may need to interact with. Each culture will gather in a different place to prepare for the assignments. When the preparation is done, each cultural group will divide into two parties. One party will “travel to” meet with a delegation from the other culture at their location while a delegation from their culture will “travel to” meet with the remainder of your cultural group at your own location. You will decide in your group who will go to the other location and who will host the visiting delegation at your own location. Divide the large group into an equal number of smaller cultural groups. (choose to work with two cultures or four cultures in each case pairing two specific cultures) Each culture group should have at least 6 members as they will need to select two small delegations to meet with one other culture. A delegation should have no less than 3 members. Having separated the different cultural groups (from the exercise) into different areas/corners in the large room or into separate breakout rooms, you hand out the comprehensive cultural sheets to each individual in a particular culture. Do not share this with other cultures. 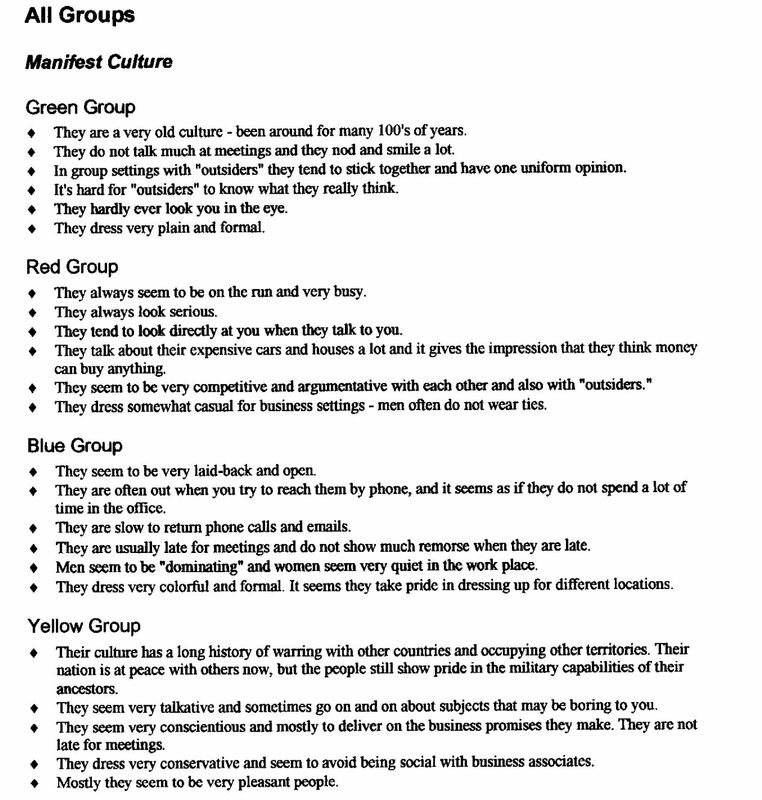 Only members of the group that represent for example the “Red” culture get to read the comprehensive sheet for the Red culture. Allow about 5 minutes for them to read through it. 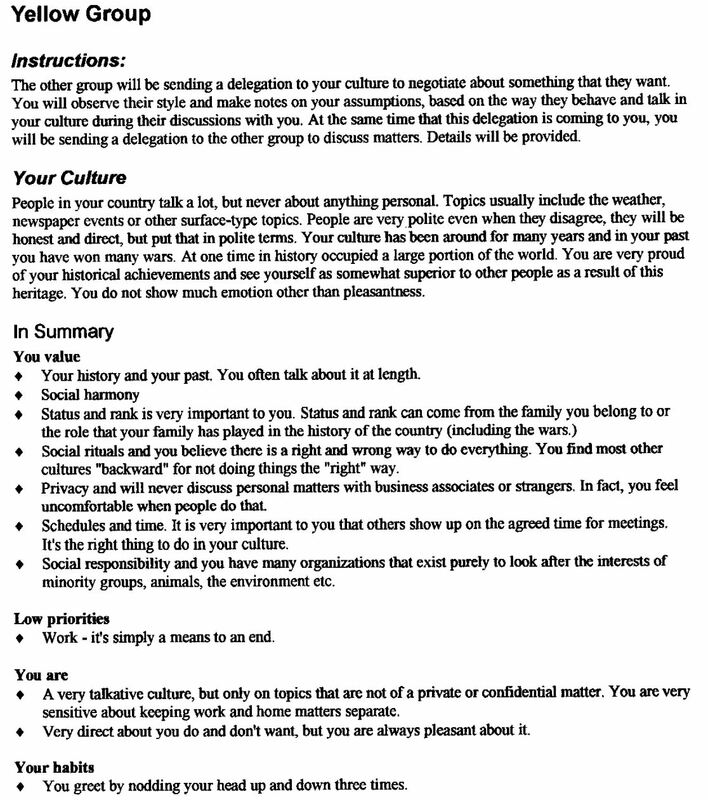 Now hand out the Culture sheet showing all of the cultures in summary form. Each member of each cultural group gets this handout. At the same time you verbally share with each culture what their assignments are in meeting with a delegation from the other culture. (see assignments above). They know which culture will interact with them. 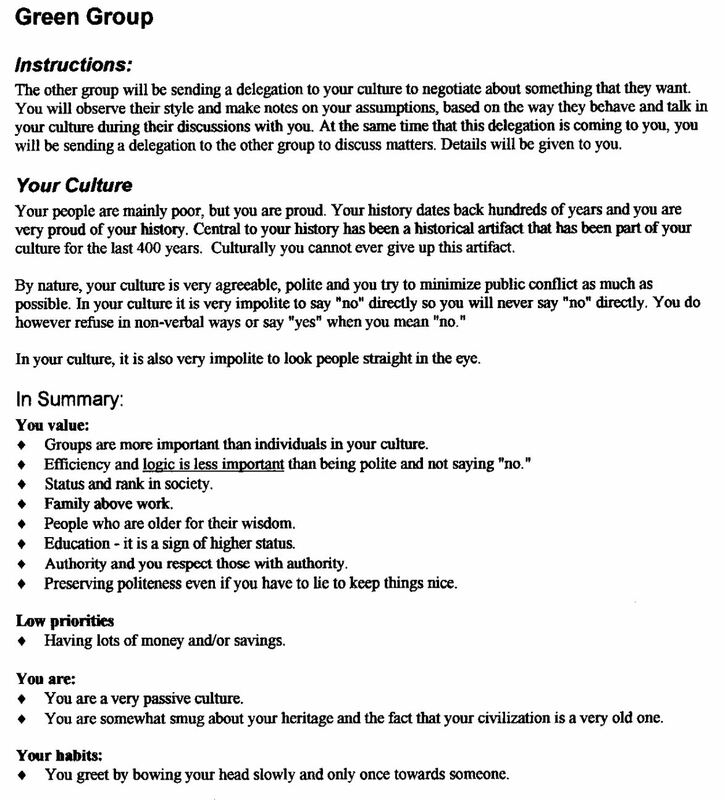 Give each cultural group about 15 minutes to study their assignments and what is shown on the Culture preparation sheets for all cultures vs their own culture in order to prepare how to approach interactions with them. Half of the first cultural group will “travel” to have a meeting with half of the second culture. Half of the second cultural group will travel to meet with the remainder of the first culture to engage in the assignment. Allow 15 minutes for delegations to engage and execute their assignments with the other culture. After 15 minutes ask everyone to come back to the large meeting room for a discussion and debriefing session on the exercise. In what ways did we encounter unexpected behaviors? How did their way of interacting make it harder for us to succeed? What would we do differently on this same assignment now that we have experienced the two interactions with the other culture? Each of the culture groups reports back on those questions to the larger group. In large group debrief further on learnings from the exercise and how team members may approach some team aspects differently when they are interacting with someone from a different culture then their own? Do they have tips and advice for others who have to regularly communicate or collaborate with those from other cultures? Bonus debrief points – if you have the time. How did the way women were perceived make a difference in the exercise? Do you think that it mattered whether the delegates were from a different generation? How would you advise others on how to take additional aspects into consideration when it comes to cross cultural communication and collaboration? Consider an add-on exercise where each participant is asked to jot down the areas where he/she may have had the most difficulty, questions or had the most insights during this exercise. Is there an area that he/she would like to explore further to improve own understanding or skills? This should be captured in the Personal Development Plan of each participant. Do remember to mention stereotyping and how that can cause hurt feelings and misunderstandings. Avoid doing this trap while facilitating the exercise. Be aware of showing any “funny” videos or clips that depict how cultures misunderstand each other. They are often based on stereotypes and can easily cause upsets. Humor is not universally interpreted in the same way by those from different cultures. Define that in this case (Exercise) culture refers to national cultures, but clarify that there are several subcultures, which can also make collaboration and communication tough. i.e. operations and sales. I recommend that you share the iceberg model, which helps teams appreciate the vast amount of cultural data which is not visible, but which can lead to misunderstandings and misinterpretations with others. Workshare – means that more than one office is working on the project. There is typically one office which is in the lead while other offices collaborate on the project. They all have to follow the same project protocols in order to avoid confusion and differences in end results produced. I am a strong believer in experiential learning – learning by or based on an experience and observation. Key learning points seem to be integrated faster and stronger when the learners are put in a situation where the skills they need to learn or apply are put to the test. The resource I am sharing is a group or team exercise focused on the style of a leader and how a leader approaches employee issues given their own background and preferences. The backdrop for the experience could be situational leadership or Emotional Intelligence for leaders. It is up to the trainer or facilitator to choose the right materials to suit the needs of the team or group. The exercise requires some volunteers to engage in role-play based on specific scripts – included in the resource. The key to this exercise is to showcase the possible dilemmas that leaders can face when confronted with employee behavior that seemingly goes against their own values or goals at work. The discussion after the role-play exercises is where the most value can be realized by reflecting on what the group saw and experienced during the role-play and then relating that to their day-to-day work-life. This helps each leader determine how he or she could adopt a new mindset in dealing with difficult discussions with employees after the learning event. This exercise works well for groups ranging from 8 to 16 people. Larger groups of 20 people or more can work too, but you may need to add in an additional step – a small group exercise. In that case, divide the group into smaller groups of 4 or 5 people and have them discuss the exercise debrief questions in the small groups before requesting each of the small groups to report back to the larger group for further discussion. You may want to consider an additional facilitator to assist if you are dealing with groups larger than 20 people. Without emotional intelligence or a compassionate approach to interpersonal relationships even leaders with the best technical minds and education will never be great leaders with motivated followers. Exercises like the resource I share here can help trainers and facilitators bring home the importance of having the right approach and encourage a personal change process in developing leaders. How many leaders are we developing for future leadership roles? Where should you be spending your employee development efforts? What is the best way to spend your training budget to contribute to the company’s ability to produce desired results? You may benefit from doing a talent audit – review your team and your leaders to get to a thorough understanding of the needs of each individual and the capabilities of your entire team/organization. The most common rating model that is used for employees and leaders is shown below – note how well they are performing in their current roles and then compare that to how much potential do they still have to move up a level or two in the company. The vertical axis is where you rate the performance of the employee and the horizontal scale is where you rate his or her potential to reach higher levels of leadership in the company if you develop him or her. The green star example would be a leader who is performing exceptionally high and who also still has the potential to move up more levels within the company – maybe 2 or 3 levels more in the next few years. The red star would represent a leader or employee who is not performing according to expectations at all and who has not shown any signs of being capable of or motivated to move up any levels in the company. The resource I am sharing today is a tool to help you determine where your current employees and leaders would fit on the model shown above. All you need to do is answer yes or no to the questions shown. When you get to the bottom count the number of times you answered yes and calculate the % yes score (total yes answers divided by number of questions). That could be an indicator of where your employee/leader could be plotted against each of the axis shown in the model above. (Imagine the top end of the scale is 100% and the “low” part of the scale is 0%). Alternatively you can use the next figure (see below) to plot the employees. Review their latest performance review outcomes against the vertical scale: Exceeds Expectations, Meets Expectations and Below Expectations. Looking at the employee’s motivation, mindset and capabilities – does he or she have the potential to move up some levels in the company? Plot that against the horizontal axis. To ensure a good perspective of the employee pool that you are reviewing, ask various executives/senior managers who have regular contact with the employees to complete the list of questions in the resource. Combine all the answers to arrive at the final plot on the graphic for the employees/ leaders. Always perform a sanity check before you complete the final plot – employees must have the motivation and interest to advance in their own careers and have great interpersonal relationship skills before you can plot them towards the middle and right side of the horizontal scale. These employees are able to grow to the top of the organization. Accelerate their development and make sure they have stretch-goal assignments. These employees are good performers who need to be recognized and you should keep them engaged. Retention is the word, especially if they possess key skills that are hard to find in the market. These employees need training, coaching and a structured approach to improve on their skills and competencies. Since they have the motivation, ambition and ability to move to higher roles in the company, the gap between future role requirements and current performance assessments should be driving the development actions needed. The performance of these employees has to improve. There are several reasons why someone could be plotted in this group. a) some executives/managers see potential here, but the employees’ own motivation or ambition may not align with that – move the employee into the correct group – towards the left; b) personal or interpersonal issues may be at work here – try to resolve; c) employee does not understand what is required from a performance perspective – ensure clear goals and expectations are set and train/coach and review regularly to ensure that performance does improve. This process is not static and you should review your plots at least once a year. It is possible for employees to move into other areas of the graphic after they get the promotion they worked towards or their home situation changes and it changes their own motivation and ambition at work. This annual review is an exercise that should include the executive team or management team for that location, because it is important that the senior team understands the talent and leadership potential that is available at that location. It is also important that multiple views are incorporated and discussed during the review sessions. It all starts with doing the first talent audit though and these tools will hopefully help you do that. One area that often causes misunderstandings and frustrations in the workplace is when two interfacing employees have different interpersonal styles and ways of communicating. Being different from each other mostly means that they do not understand why the other party is doing and saying things in the manner that they do. Most of us do have the ability to make small changes to how we do or say things in order to improve collaboration and interfacing with others and this resource can help by creating awareness, which is the first step towards improvement. The resource I am sharing today can be used for relationships with customers, other employees, work-related contacts and even friends or loved ones. It helps you reflect on the interpersonal style that the other person displays in his or her behaviors. Building on this awareness this resource enables you to be more mindful of the best ways to interact with that specific person to have a better relationship with him or her. Team feedback – Depending on the time you have available and the size of the team you may also ask each team member to map out each other team member using this resource. This means each person gets feedback from the entire team on how each team member sees them. The outcome could magnify self-awareness in the team and drive interpersonal relationship improvements across the entire team. Misunderstandings can lead to a lot of misalignments between team members and can result in rework, which is not very effective. Better interactions with others make the workday more fun and goes a long way towards employees feeling more productive and effective at work. The ability to reflect and learn from experiences and observations is one I most commonly associate with and admire in the best leaders that I have met over the years. This resource can be used to help leaders reflect on their own behaviors to identify development and improvement needs. This resource is also useful when applied as a 360-type feedback tool. In that case the leader rates himself or herself and then requests feedback from others – in more senior roles, same level peers or in lower hierarchical roles – interacting with the leader on a regular basis. The 360 view can help eliminate any blind-spots that a leader may have concerning his or her own leadership behaviors as the perspectives are from others who often interface with the leader. The leadership rating worksheet shared contains a sheet for self rating and also a sheet which can be shared with others for feedback purposes. Each of the aspects come with a brief description to ensure ratings are comparable after you have obtained the feedback from others. Discussing the results with a coach or mentor to get guidance on what to focus on and how to plan next steps to improve on key leadership aspects. If a manager rates all of the leaders working in his or her department using this tool you can compare the leaders to each other in terms of strengths and development needs. This would be useful information to help select the best development programs for the team over the next year (for example). Developing leadership skills is a lifelong journey. We can all learn to do better in some aspects over time and tools like this one can be a very useful check-in for reflection even for those who have been leaders for a long time. It is also true that we expect more from leaders in a globalized business world and concepts like “diversity conscious” and “cross cultural” skills are becoming very important for leaders to be effective on a global scale.